Throughout human history the planet Mars has held mankind’s rapt attention. When telescopes were sufficiently advanced by the late nineteenth century, the red planet seasonally fogged over with dust storms. After such storms it appeared to darken in spots with what was thought to be vegetation. 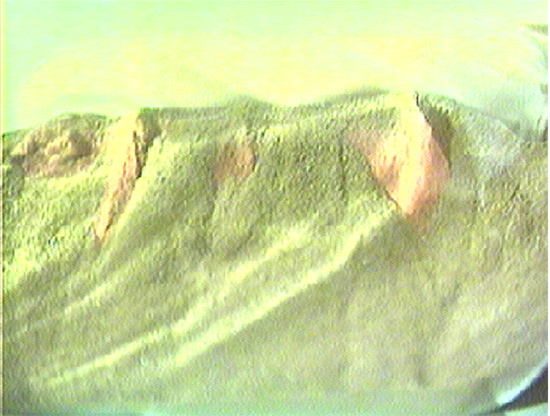 But when the Mariner 4, 6, and 7 flybys of the late 60s and the Mariner 9 orbiter in 1971 and Viking I and II landings in 1976 showed a barren, lifeless terrain, with no evidence of even the lowliest forms of vegetation, the “greening” of Mars was thought to result from the inorganic oxidation and reduction of ferruginous soils on the planet’s surface. This brief essay proposes a speculative mechanism for such a transformation. Periodically the inclement winds on Mars are estimated to gale in excess of 200 miles per hour (>300 kph), sending dust particles high into the thin atmosphere. This atmosphere, consisting mainly of carbon dioxide with traces of water vapor, is less than one percent the air pressure we enjoy on planet Earth. Thus, airlifted and suspended dust particles themselves are mainly microscopic, taking days or weeks to settle. But the extreme velocity of the surface winds also blows larger particles about to collect in drifts and to scour the landscape. And, over periods measured in eons, many features have been eroded and smoothed to show a wasteland marked by a grand canyon (Valles Marineris), scattered craters, an enormous extinct volcano (Olympus Mons) among several others, and numerous other gross outcroppings, but the planet’s surface is largely devoid of finer detail. However, a few craters do show little evidence of erosion and may be relatively recent events in Martian geological history. Mars rotates diurnally in approximately 24 hours and 40 minutes, and its axis is tilted at an angle of some 25°, not dissimilar in either respect to Earth. It revolves in its orbit about the Sun in 1.88 Earth years, and consequently it has much longer seasons. But every spring in the northern hemisphere, there is a partial melting or sublimation of the polar ice cap, preceded by keening windstorms, which in turn is followed by a gradual darkening of the Martian landscape extending down toward the equator. It was this darkening—this “greening”—which gave credence to the idea that vegetation likely existed on Mars. The illustration of the microcosmic Martian landscape in the quart bottle looks for all the world like a Ludek Pesek painting in miniature, replete with ruddy arroyos, canyons, and peaks, but with a darker greenish detritus in simulated moraines. The particles which make up this scene are actually the Buell dust product of a high temperature rotary kiln. They comprise agglomerated microspheres of fused magnesium oxide (periclase) of fairly uniform size (20-40 μm), with patina-like coatings of red (oxidized) and green (reduced) iron oxides, as determined by the McCrone Research Institute of Chicago. Under microscopic examination, the colors appear more reddish-orange and yellowish-green in hue. One of the more interesting features of the mixture of these microspheres is that the red ones are magnetically permeable while the green are not, being easily separated by a teflon-coated stirring magnet despite the tenuous coating of the iron moiety. It was this peculiar property that was first noted in the mid-1960s and which drew my attention to the phenomenon associated with the then-known weather patterns on Mars. Namely, if the cohesiveness of the reddish particles, inherent in their magnetic permeability, were in any respect related to the occurrences on Mars, then such Martian particulates themselves would exhibit similar permeability as well as weak magnetism. In fact, in 1976 the Viking landers found as much as 4% magnetic permeability of the Martian soil, which was considerably higher than expected. Other than iron itself, we know that magnetite (Fe3O4), maghemite (Fe2O3), and pyrrhotite (Fe5S6 to Fe16S17) are magnetically permeable, although their colors tend to range from yellowish brown to black. However, the surface of Mars from the viewpoint of both the Viking and 1997 Surveyor probes has been a rather uniform ruddy color. And yet, the airborne magnetically permeable particulates were found to have a darker albedo (reflectance) than the soil samples, which may merely indicate that the airborne particles did not have the ruddy overlay which heavily coated the soil samples. The postulated microspherules on Mars are conjectured to come in two varieties, an oxidized orange-red ferric iron and a reduced yellow-green ferrous iron assortment. The ferric iron spherules would be magnetically permeable while the ferrous would not. The significance of the two kinds of spherules is that the magnetic cohesiveness of the permeable ferric glasslike particles would impart the characteristic red color to the surface of Mars, as well as contributing to its comparative stickiness, while the greenish ferrites would give the deceptive impression of vegetation growing in select regions of the planet following the violent windstorms of a Martian winter, as well as contributing to the appearance of moraine-like flows in various arroyos. These windstorms occur approximately every two of our own years, and although the blustering gales are extremely tenuous they race around the planet in excess of 200 mph and raise voluminous dust clouds which obscure the surface (an early Soviet space probe landed during one of these storms and ceased operating within two hours). When these winds ultimately subside, there is a notable “greening,” or at least a darkening of the planet—a phenomenon which was first attributed something over a century ago to the growth of vegetation. Thus, the false foliage might be more of a physical event than a chemical one, much less a biotic episode. However, for purposes of this speculation, oxidation-reduction processes effected by solar radiation and the Martian atmosphere are expected to contribute significantly to the anomalous color changes. The origin of these hypothetical microspheres would most likely be in some ancient disaster that wracked the planet, where an asteroidal impact or volcanic event, or both, brecciated the surface and boiled off both atmosphere and ocean, leaving a glassy vestige of microscopic tektites on the ground and very little residual airmass. The speculation that Mars is covered by microspherules of glassy particles stems from observations of earthbound samples that have experienced extraordinary thermal conditions. Based on the geohistory of Mars as it is currently surmised, it is anticipated that such microspheres may be primarily composed of refractory minerals other than iron, in either amorphous or crystalline forms, and imbued with a patina of mineralized iron compounds to impart their characteristic coloration to the sands of Mars.